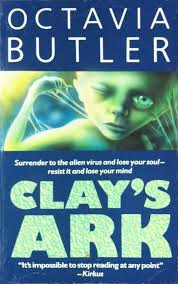 Back in March, I read and wrote on Butler’s Clay’s Ark (1984). In the post, I was not hesitant to express why I felt that it was by far Butler’s worst book. However, now when I read that post I wish I had not written it, but that was before I had the opportunity to read Survivor (1978). Not only did I express my frustration for the book, but I also denied, and neglected the most important person—Keira, the black woman protagonist of Clay’s Ark. The Maslin family mistakenly drove into a trap created by the humans who contracted “Proxi Two”—the Clay Ark disease—and were in need of finding new hosts. Captured by the sickly, gray colored zombies, Keira, her father Blake, and twin Rane must fend for themselves, avoid being scratched by the Clay Arks, and survive in the desert isolated. Yet, knocking on death’s door, Keira, the weakest one and mostly likely to die, is the only one who survives. After learning the her father had been shot and run over by a truck, and her sister had been shot and beheaded, Keira “sat on the closet floor with bound hands and feet, reading from cardboard boxes of old magazines.” Her calm, unnmoved actions mirror those of Pilate in Song of Solomon and Sula in Sula. Keira’s willingness to become a host to the Clay Ark disease by the end of the book had helped to cure her leukemia. Now a stronger, more confident mother of an abnormal child, Keira asserts herself as a new member of the zombies that roam the desert seeking to infect others. Butler's decisions to give power to seemingly powerless women are recurring practices in her works.